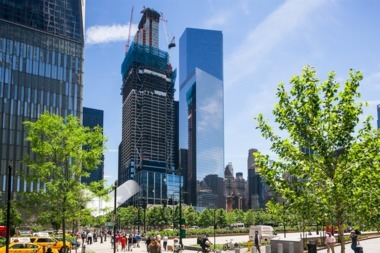 Three World Trade Center, slated for completion in 2018, is now soaring 80 stories in the air. LOWER MANHATTAN — With a two-ton bucket hoisted 1,079 feet in the air, the final pour of concrete soared to the very top of 3 World Trade Center Thursday. 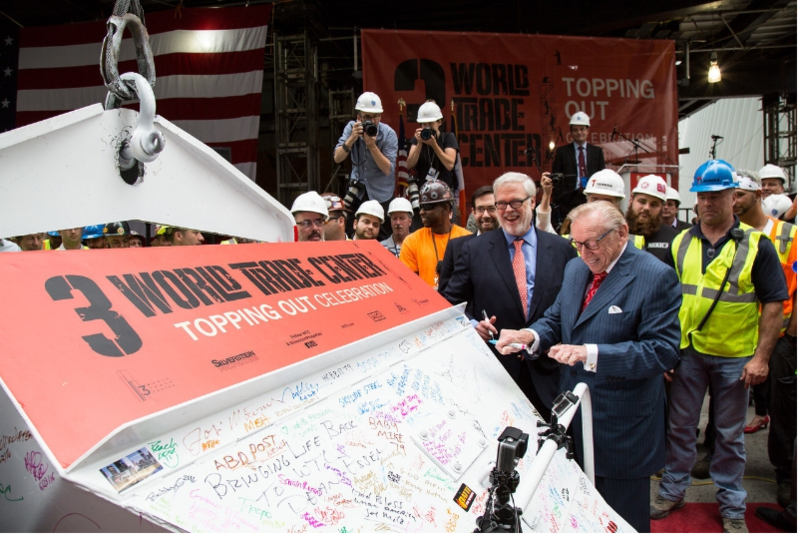 The $2.5 billion skyscraper's owner, Larry Silverstein, was joined by about 1,000 construction workers who'd helped build the tower over the past six years Thursday morning for the "topping out" ceremony. Workers and Silverstein signed the giant bucket, adorned with the same American flag used to top out 7 World Trade and 4 World Trade, before it was lifted up. The 80-story skyscraper has reached it top height, but additional steel and glass work need to be done, officials said. The building, designed by architect Richard Rogers, will be home to media giant GroupM when its slated to open in 2018. It's the fourth World Trade Center tower to be rebuilt, joining 7 World Trade Center, 4 World Trade Center and the soaring One World Trade Center, now the tallest building in America.